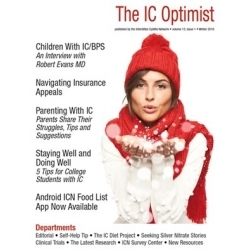 (1) Editorial: Does "Big Pharma" control the IC movement? - Jill Osborne tackles the misperception that big pharma controls the IC movement. In fact, they walked away from IC more than a decade ago. Learn about the history and two promising new companies that may be investing in the future of IC outreach and care. Simply put, we can't do it alone. We need their help. (2) Pelvic Floor Therapy - Does it work? - Author Stacey Shannon asks an important question “Why are some urologists not acknowledging the role of pelvic floor dysfunction?” Despite ample evidence that PFD is present in most IC patients and that pelvic floor physical therapy is the single most effective treatment studied to date, patients are often left high and dry by some urologists who refuse to test the pelvic floor muscles and/or provide a referral for treatment. She shares several patient stories and insight from physical therapists. (3) Insights from the MAPP Research Network - If you’ve wondered what the state of IC research is today look no further than the MAPP Research Network. 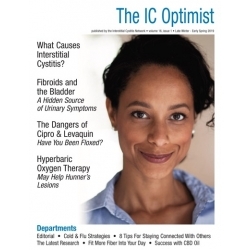 Funded by the US National Institutes of Health in 2008, this research effort includes scientists around the country (and world) in a quest to solve the mysteries of IC and chronic prostatitis. We include a very thorough update of their research findings to date. 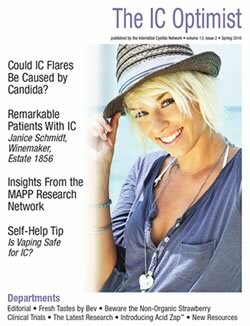 (4) Could IC Flares Be Caused by Candida - One fascinating MAPP study released this year was the discovery of fungi/candida in the urine of patients struggling with IC flares. Could this be the missing link for many patients who simply can't figure out why certain flares occur? We think so. (5) Remarkable Patients With IC - We launch a new series for the IC community, profiles of patients who have done remarkable things despite having pelvic pain. In our inaugural feature, we introduce you to Janice Schmidt, an award winning winemaker who has struggled with IC for years. In fact, it runs in her family. (6) Is Vaping Safe For Interstitial Cystitis - We know that tobacco smoke is a well known trigger for IC flares as well as bladder cancer. Is vaping any safer? We discuss the pros and cons in this new self-help tip. (7) Five Ways To Not Fall Victim to Chronic Pelvic Pain - Activist and writer Tali Keteri shares five tips to help you lift your spirit and regain some of those activities that you miss because of IC. She knows what she's talking about. She's a master at living life to the fullest! (8) Clinical Trial Announcements - The LiNKA studies for Hunner's lesions and bladder pain have added several new research centers across the country! (10) Beware the Non-Organic Strawberry - The Environmental Working Group released the 2016 list of the Dirty Dozen fruits and veggies. Topping the list for pesticide contamination was strawberries! We share the shocking research here. Who knew that the strawberry industry was using so many potentially carcinogenic chemicals on their crops.